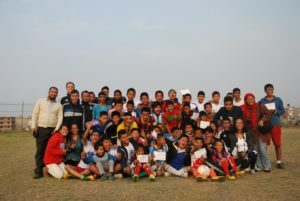 Ambassadors Football Nepal began in 2012 with a visit from members of Ambassadors Football leadership team to plan a pro player tour to Nepal the following December 2013. 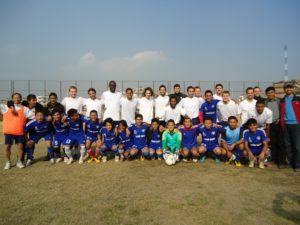 We began to work with the leadership through all of their visits that followed including, a meeting in March with Mr. Ganesh Thapa the former President of the All Nepal Football Association (ANFA), a coaches training course in October, and the eventual Ambassadors Football Pro Tour in December. 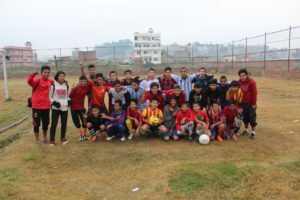 During these times together it was clear that the Lord was calling us to begin a local football ministry with Ambassadors branching out from our current Christian Sports Fellowship (CSF) Nepal connection. Together we conducted a TREC (Training Resourcing Equipping Churches/Coaches) training course with Ambassadors where a team of international coaches provided instruction to 36 participants. It was during the TREC that the team believed it was now time for Ambassadors to have an office in Nepal. With prayer and meetings with the leadership Romi Tandukar was offered the country Director position for Ambassadors Football Nepal. Romi was a volunteer for CSF and other local sports ministries for the past 7 years. The official work in Nepal began in April 2014. Two local coaches where prayerfully selected in September of 2014 to assist Romi in the local work. A meeting with CSF resulted in a partnership in football ministry and provided access to a facility for training. We began our training for children ages 6 to 14 and we had 24 kids attend our first session. The following week we had 35 attendees and the numbers continued to grow each week. This has let us to form a Club and conduct Camps for the children in our ministry. Our current club is for children ages 6 to 16 and we train at the local CSF facility. Through the club we have been able to impact 149 children in a year and a half, completing 4 seasons of club training and impacting 15 coaches. Our plans are to continue to grow the Club size each year. Provide the highest quality of football instruction. Ambassadors believe in striving for excellence in the coaching and in the overall program. Provide a positive and loving Christian environment. Each coach has the opportunity to demonstrate the love of Jesus through activities and therefore have a positive life-long impact on the lives of the children. Challenge and present the children with the opportunity to put their faith in Jesus Christ as their Lord and Savior. The camp includes Bible times, testimonies and assemblies that clearly present the Good News. Have fun! We desire that the football camp week be a positive experience for the children, parents, coaches and all involved!